The first thing that caught our eye on the way to Amritsar airport was a sari-clad woman scooterist complete with a helmet and a handkerchief for a mask. Then a bevy of college girls went scooting past on their way home after classes. This was in stark contrast to Pakistan where, we had heard a few days earlier, of the first-ever batch of eight female Lahore Police motorcyclists who had graduated and supposedly made history of sorts. In India it is a not at all an unusual sight to see women scooterists and cyclists on the road, specially in small towns where public transport is not as good as cities like Delhi. At Amritsar airport we keenly read a prominently displayed notice which exempted only 27 key government functionaries including the President, Prime Minister, Supreme Court Judges, Governors, Chief Ministers and Federal & State Ministers from security checking. The list did NOT include members of Lok Sabha, nor did it include Service Chiefs of Staff! VIP culture as we have it, is non existent in Delhi as well as other cities that we went to. Display of arms is strictly prohibited and private guards usually have just a baton. Only one shooter in a group of guards is authorised to keep a firearm with limited rounds. All government officials travel in the busted up and ugly looking ‘Ambassador’ a copy of Morris Oxford of the fifties. This includes the Prime Minister, Ministers and Service Chiefs. It is also not uncommon to see even Wg Cdrs and Lt Cols going to work on scooters. Indians are not ostentatious like we are. During our two weeks in Delhi, Agra, Jaipur and Jalandhar, I saw just 5-6 odd Mercedes, no BMWs and no sports cars. Everybody drives a Maruti, Tata Indica, Suzuki Swift or scooters and motor bikes. Indians dress up very simply and their women are not given to gloss and glitter like ours. Women dress up in saris, shalwar/churidar-kamiz and jeans-tees in about equal numbers. Men are mostly clad in trousers and shirts. While I am on dresses, I must say that the glamorous sari is not what you see in films and on TV. In real life, most sari-wearers are quite fat, but the wonder is how brazenly they show their guts (pardon the pun)! We found the average Indian rather docile compared to our adrenaline-high countrymen. With the general level of education being better than ours, and respect for authority evidently greater, it seemed that civility was coming of age in India. The attitude of shopkeepers was very welcoming and friendly and, they spent every effort to rope in even the most die-hard window shoppers. We witnessed an incredible sight during our early morning train trip from Delhi to Jalandhar. On both sides of the track, one vast open air toilet ran for miles and miles. There was no consternation as pigs and dogs rummaged around and trains whistled past. It was also sad to see humans degraded to the level of animals. But that is India. As the train rattled past Panipat, we were reminded of Emperor Babar’s disdain for such things Hindustani!! Talking of trains, I must not omit mention of the excellent service that we found in our travels to Jaipur and Jalandhar. The Shatabdi (Millenium) Express is as good as it gets in South Asia. This train was clean, seating was comfortable, newspapers and magazines were plenty, the food was a delight for a vegetarian like me and, not the least, the hostesses were most courteous and smart. I must also add that the train was an absolute stickler for punctuality, an attribute little cared for in our part of the world. Environment-consciousness is strong in India. All Delhi buses run on CNG; so do rickshaws. Parks in Delhi are numerous where families and dating couples can cavort without fear of molestation. Trees abound in the city and municipal laws prohibit cutting even a branch without permission. Most cars are parked outside on the streets and, as a consequence, bird droppings are a nuisance to car-owners. There are NO billboards in Delhi and Jaipur. Jalandhar has some, but small-sized ones. None of the mega-sized ones that have utterly spoiled Lahore’s skyline. Active mosques are managed by Muslim trustees, but their state leaves a lot to be desired. The Jamia Masjid, Delhi is a pale reflection of its counterpart in Lahore, largely due to mismanagement and corruption by the former’s executive body. The Archaeological Survey of India has, however done a good job in preserving all monuments, understandably, as they are magnets for tourists and bring in substantial revenue. Muslims are nearly 50% in Old Delhi area, but unfortunately, their condition is pathetic. Mostly they are rickshaw pullers, carpenters, car mechanics; the rest are content with being idlers, waiting for better times by the Will of Allah. “Agra Taj, Agra Taj…,” so went the cacophony of the wagon conductors as we passed by a wagon stand on the outskirts of Agra. The calls were reminiscent of exactly similar ones we often used to hear at our own wagon stops while driving to the PAF base at Mauripur, for Agra Taj Colony is a dense locale not too far from there. This time it was surely different, as we were driving to the actual Taj in Agra, while carefully skirting an IAF base that lies a few miles away from the famous mausoleum. 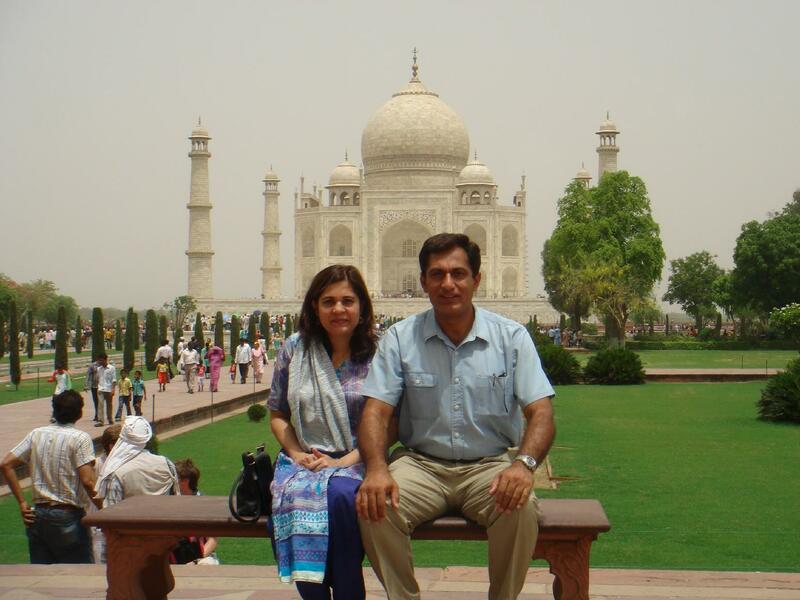 Accompanied by my wife, we had hired a private taxi for a Delhi-Agra round trip. We set out early in the morning, with a very talkative and confiding driver named Anwar, for company. A historian of some substance, Anwar was ever-ready with a commentary about any monument, temple or mosque that was visible from the roadside. After a three-hour drive from Delhi, over a highway studded with the most stubborn truck drivers, we stopped for a coffee break at McDonald’s near the huge Mathura Refinery complex. One could catch the whiff of petroleum in the air for miles. Mathura, the birthplace of the legendary god Krishna of the Hindu pantheon and also an ancient centre of Buddhist learning, was visible from a distance. The gleaming Jamia Masjid built by Emperor Aurangzeb clearly stood out on the skyline. Anwar was quick to point out that the mosque shares a wall with the Garb-Griha Mandir, without any fuss. Driving further on, we stopped by at Sikandara near Agra. The small suburb houses Emperor Akbar’s mausoleum, said to have been designed and started by Akbar himself, but completed by his son Jahangir. The tomb’s entrance portal has four white marble minarets which are said to be precursors of those on the Taj Mahal. These are, however, disproportionately tall and contrast oddly with the main red sandstone structure. Any comparison with the Taj ends right there, as we were to find out soon. Anwar advised us for an early lunch at Agra and it did not take us long to spot Bikanervala’s, the famous multi-menu eatery chain that boasts just about every culinary delight India has to offer. A hearty South Indian veggie fare filled us up and we hastened towards the Taj, lest the ticket booths there closed down for a one-hour lunch break. As we drove through Agra, it was hard to believe that it was once the imperial Mughal capital. Now a disorderly and dirty city with bubbling sewers and broken roads, it was only the Taj Mahal that beckoned weary travellers like us. The ubiquitous touts, so often seen chasing tourists in the sub-continent, were busy beckoning in a chatter all too familiar. (Guide chahye? Photo khichwayee ga? Achha dikhaen ge sab kuch, ispeshal … and so on). As we approached the ticket booths, an overpowering stench started to numb whatever remained of our sniffers. Litter, camel droppings and rubble were equally sore on the eyes. We wondered if our senses would be up to speed for the impending study of the world’s most beautiful building. At the booths we got a concessional ticket of Rs 200 for being a SAARC member, compared to the other foreigners who are charged Rs 700 a peep. Locals pay Rs 35. While walking towards the portal of the Taj, we noticed that we were inviting odd stares, which got us wondering. The mystery was resolved a short while later when we overheard a few ladies who seemed completely beguiled by the style of my wife’s shalwar-kameez, as well as the lawn print. They couldn’t resist asking us if we were Pakistanis, because such lovely ‘salwar suits’ were not seen in India, they admitted. Suitably flattered, we thought it to be just the right note to start the tour. Determined not to follow the hackneyed ‘visual’ cliché of the Taj as seen in the stereotype frontal images, we approached the monument cautiously. The Taj complex essentially consists of the imposing entrance portal, the beautifully laid lawns and fountains, two identical red sandstone structures facing inwards on either side of the Taj (one a mosque, the other a mehman-khana or guest house), a museum and the glorious mausoleum itself. Judgements as to the beauty of the building have been made ever since 1653, when it was completed and, I know of only one bigot of a philosopher called Aldous Huxley who described everything about the Taj as ugly. We had no preconceived notions and saw no harm in agreeing with the multitude about its beauty. The structure, abutting the meandering sand banks of River Yamuna, is indeed, immensely attractive and pleasing to the eyes when seen as a whole ie, together with the large expanse of gardens and fountains as well as the minarets. Perfect proportions, delicate balance and extreme symmetry cannot be missed by any, but the most callous observer. Exquisite inlay work consists of colourful geometric and floral designs along with precious stones that embellish the somewhat sombre white marble. The extremely fine calligraphy along the walls and arches is cleverly executed so that the size of Quranic verses increases with height, giving the illusion of a uniformly flowing script. The minarets particularly seem to act as sentinels, much like the military guards at modern tombs. I felt, however, that these could have been better embellished for they seem somewhat drab as far as decorative elements are concerned. No inlays, no calligraphy, no trimmings. One gets the impression that the minarets were done at the end, when two decades of drudgery had taken a toll on the workers as well as supervisors and, they wanted to get over with it, after all. Well, that critique should suffice as I am no expert purveyor of fine art and architecture, really. Personally, I would lay more emphasis on the concept than the structure itself. Might one suggest that the Taj is one of the most beautiful funerary tributes ever? The high point of our trip was the search for our roots in Jalandhar. First we went to my wife Samar's grandparents' (nana's) house in the city. It was easy to locate, despite some place & road name changes. The shopkeepers of the locality known as Guru Bazaar started filling us up with refreshments, the sooner word got around that someone from Lahore was amidst. The owner of the house Jagdeep Singh Thakur took us around after another round of refreshments. 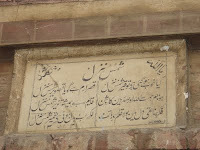 We saw a marble plaque on the front facade which read “Shams Manzil”, with the grandfather's name (Rehmat-ullah) and the date of construction 1331 AH (1909 AD). An aside to the visit was my phone call, later in the day, to Thakur, requesting him to let us have the marble plaque. He surprised us with an immediate response by saying that it was really our house and we could collect the plaque next morning! We visited the next day again and collected the plaque which weighed 15 kilos! Carrying such a heavy item in suitcases that were already exploding wasn't a good idea, so we went to some marble cutting factories in the outskirts of the city, to have the plaque sliced across, but their suggestion to send it to Rajasthan for such drastic cutting got us to rethink the whole thing. We decided to take a chance with the Indian Customs at Wagah. 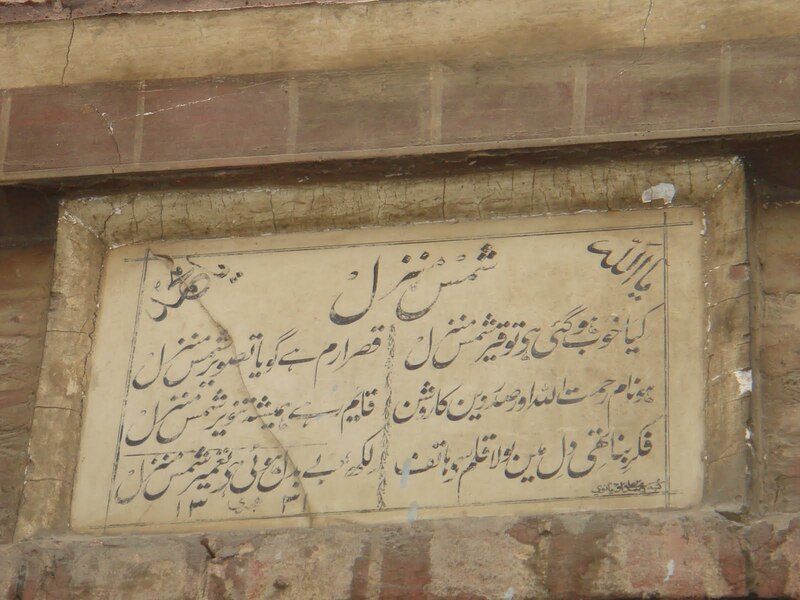 The problem was that a plaque carrying Urdu script was sure to be construed as an antique from a Mughal monument. We had photographs to prove our point and also, we could have the Customs officials talk to the house owner if needed. But when we converted the Islamic-era date indicated on the plaque, we were horrified to discover that it was 99 years old and, we were precariously close to violating the Antiquities Act which penalises someone for taking out items older than 100 years! In the event, nothing happened at Wagah, the babu wished us a happy end to our journey and.....voila..... the plaque has come home! The next stop was at the small town of Uggi (in Nakodar Tehsil) where we went looking for my nana's house. At a traffic crossing we asked a passer-by if he knew of a settlement known as Baupur. When he told us that everybody in Baupur, except one family, had moved out to a new colony by the roadside, we were crestfallen. He said that the sole family lived in a house that is known as 'Inspector ki kothi'. Suddenly our ears lit up, for my nana Badr-ud-din was a Police Inspector who served in Delhi but somehow, chose this place for his house in 1935. We drove off to the one-family settlement of 'old' Baupur which was just 3 km away. The sight of a massive banyan tree seemed to confirm my mother's memory of the place. We were received by a very genial but surprised Gurdial Singh, the 'numberdar' of Baupur. When we told him that we were probably in our nana's house, his eyes moistened and he became emotional. Then started a round of lassi, followed by nimbu-pani and tea. Lunch was ordered but the lady of the house was spared the hassle after great pleading. Elders from the nearby colony were summoned and they started narrating tales about my nana's family ("Inspector sahib was so tall that you could wear his shirt to the ankles!") They narrated how Inspector sahib had once killed the notorious dacoit Bhajna in the hills of Himachal, and was awarded two squares of land for the deed. A nearby grave of a Muslim saint by the name of Billay Shah was pointed out by Gurdial Singh, which was later confirmed by our elders. Gurdial still lights a ‘diya’ on the grave every Thursday out of respect for someone who loved God. Later, partition and its horrors came under discussion. While we were at it, I brought up a long-forgotten bit of lore in my mother's family about a pretty girl who had been snatched by the Sikhs as the families migrated. The girl was 17 then and her family was known to my mother's. Not having the slightest clue about anything more than this, I was surprised when Gurdial Singh pulled out his cell phone and called up someone to reach there immediately. After about 30 minutes, a youngish-looking chap arrived and claimed that he knew of this incident. His auntie (‘tai’) was the daughter of the kidnapped girl whose name was Rehmat bibi at the time of partition. Before we could understand what was going on, this fellow also pulled out his cell phone and asked someone to reach there immediately as there were visitors from Pakistan. Half an hour later a middle-aged woman and her 30-ish son arrived. We were told that this lady was Surinder Kaur, daughter of Rehmat bibi!! Rehmat had been married off to the kidnapper's son and, over the years had five daughters, the eldest being Surinder. Now this was filmi stuff, too surreal to digest. Surinder then broke into tears and hugged Samar for several minutes. We told her that her uncle Ibrahim (Rehmat bibi's brother) was alive and we would put her in contact with him when we got back. We took many pictures and hope to pass these to her relatives in Pakistan. Surinder told us that while her father's family kept her mother with a lot of affection and care, she lived a sad life and often cried. We learnt that Rehmat bibi had been contacted by her brother sometime in the fifties and, he asked his sister to return to Pakistan. Rehmat bibi refused as she thought that there would be no future for an ex-wife of a Sikh and, that her daughters too would have no prospects. It was such a moving tale that women were weeping, to be soon followed by the ‘numberdar’ Gurdial Singh and even our taxi driver. Phone numbers and addresses were exchanged and leave was taken on a sad note. It was, indeed, an incredible visit to Baupur. Our next stop was the settlement of Bagga near Shahkot where my grandfather (dada), Muhammad Bakhsh, used to live. The place has changed completely and there are mostly new houses except for a few old ones. We were put under charge of a 90-year old village elder by the name of Kesar Singh. We had no more clue than what my father remembered about his house being on the highest ground in the locality. Surely, Kesar Singh knew every mound and cranny, so he walked us to what is still known as “patwari’s kothi” in the then Muslim half of the village, pre-partition. Not much remains of the structure except a room and a barnyard in front of it, but the actual residence of the present ‘patwari’ is adjacent to the old one. We took a lot of pictures there too. Discussion with Kesar Singh revealed some interesting bits of history as he seemed to remember my grandfather’s brother Ali Muhammad very well. When I showed Kesar Singh’s picture to my father on my return, he immediately recognised Kesar Singh. We were also lucky to drop by my mother’s school in Uggi, where we were welcomed by the headmistress and teachers, who were quite amused to have us Lahoris in their midst. I had been planning the trip to our ancestral homes for quite some time. I must say that Google® earth was a big help, besides the bits and pieces of trivia handed down by the elders. We were able to chart out our routes with the help of satellite maps and some excellent Indian Punjab websites which were a great help. Our taxi driver Bal Kishan was the key figure who was as excited as we were in searching for our roots. Our relatives, specially the elders are absolutely enthralled by our staggering finds and, for some time now, it is mostly heritage and roots that we have been discussing. A portion of this article viz, 'Our Roots' appeared in India's weekly magazine, The Sunday Indian, 8 Aug, 2008 issue. A portion of this article viz, 'A Visit to the Taj', appeared in the daily newspaper, The News International, under the title 'Agra Taj, Agra Taj...', 13 Feb, 2011. 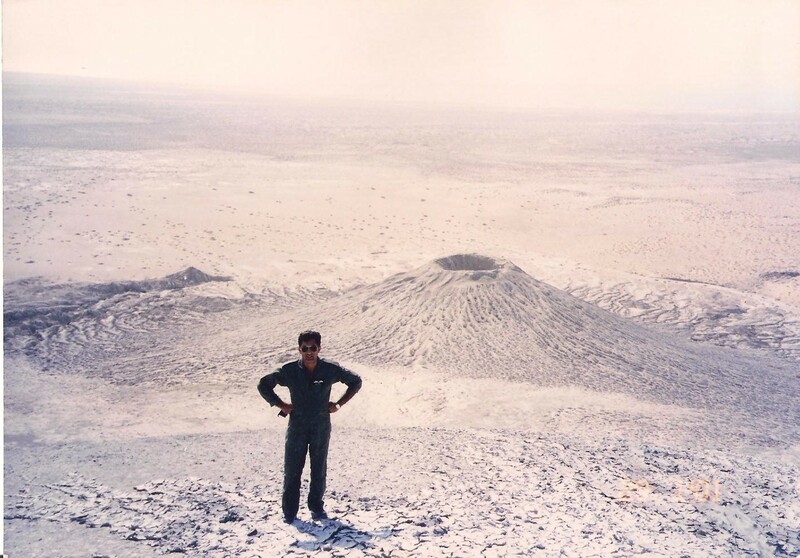 Many years ago, while on a reconnaissance sortie off the Makran Coast, I had flown over what seemed to be small volcanoes spewing out a slushy liquid. When I reported the strange geological phenomenon to my squadron mates, they promptly shrugged it off as a flight of fancy. However, when I got to fly over the same area again, I made it a point to record the spectacle with the on-board video camera. During the replay, there was a full house in the video room and everyone was awe-struck at the weird and wonderful ways of Nature. The volcanoes soon became a must-visit way point for the squadron pilots during all coastal missions. A high speed run over the volcanoes was one thing, but a close-up look at the vents had always enthused me. 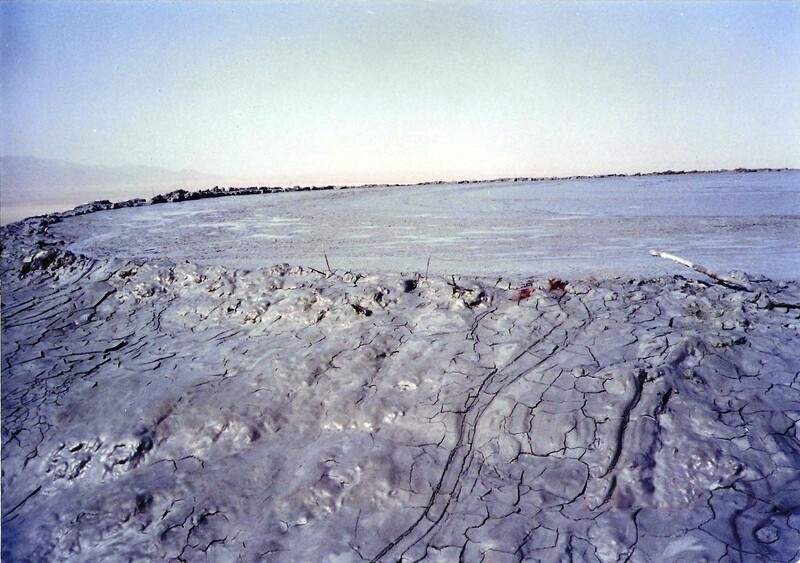 In January 2001, I, along with a few colleagues, got a chance to see and hear the bubbling froth and, heard tales about intrepid Hindu visitors for whom the mud volcanoes are sacred. They are commonly known as ‘Chandra Kops’ or cones of Ramchandra (a Hindu moon deity). Besides the three volcanoes near the coast, there are four others scattered in the Hara Mountains further inland. Located about 220-km from Karachi by road, the journey to the Chandra Kop trio is not for the faint-hearted. Though an excellent coastal highway has been completed by the Frontier Works Organisation, it will be some time before ordinary tourists feel secure enough to drive down to the volcanoes, in addition to gazing at some of the most unusual topographical features the country has to offer. 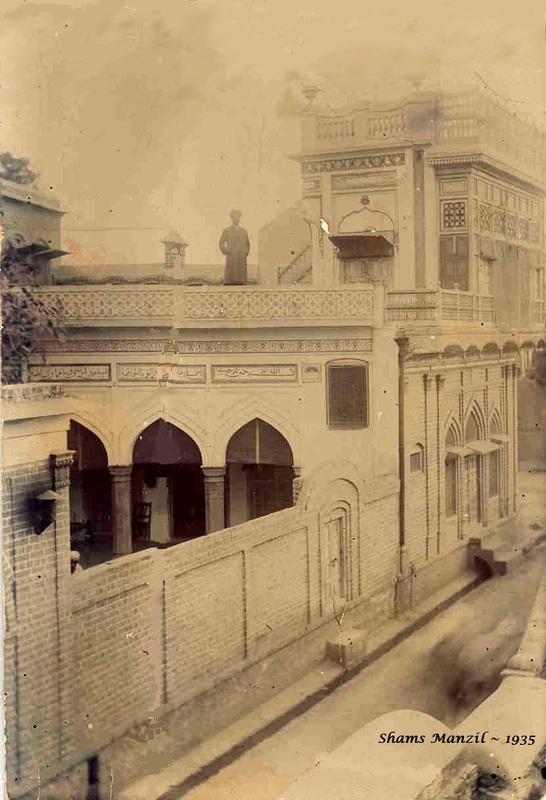 After a bone-jarring journey through harsh, forlorn countryside, which had seen us retrace Alexander’s ill-conceived and ill-fated return route to Persia via Uthal-Bela-Averan-Turbat-Pasni, we switched east to Ormara for our return journey to Karachi. The journey requires a four-wheel drive vehicle and, quite literally, a spine for adventure. A good night’s rest at the Coast Guards' check-post at Aghor was just what we needed for the next day’s journey. Breaking off from the road near a place called Sangal, we detoured south into the stark shrub-dotted wasteland that was occasionally cheered up by a chirruping lark. After driving for twenty minutes or so, we picked up the outline of the larger volcano through coastal haze. Rising to a height of 100 metres, it is about a kilometre in diameter at the base. Grey, muddy liquid could be seen oozing from the vent of the volcano. As we approached closer, the two smaller volcanoes also became visible in the vicinity. Though modest by volcano standards, the Chandra Kop trio is considered to be large-sized amongst mud volcanoes. Nearing the large volcano, we were obviously excited to have a peek down its vent. Fifteen minutes of fast climb left us panting, but it was worth every gasp because it was truly an astonishing sight. Methane gas could be smelt, as well as seen to be bubbling from the fluid that was oozing from the vent. The spilt slush had left the rim slippery and one misplaced step would have us hurtling down the slope. All the same, one step too close and a horrid, grisly end was nigh. In fact, our driver told us about a mishap that had taken place some months ago when three Hindu pilgrims who had ventured too close to the mouth, slipped and were gobbled down into the thick gooey sludge. Incense sticks placed close to the rim testified to the risk that some visitors had been taking, but confirmation of the accident from any other source could not be had. A somewhat safer ritual involves tossing of coconuts into the vent, akin to appeasement of gods at a Hindu shrine, which the volcano is considered to be. Hindu lore is not uncommon in Baluchistan, indicating a sizeable presence of Hindus sometime in the past. The exquisitely named Sri-Mati Hinglaj Temple, (more commonly known as ‘nani ka mandir’) deep in the hills north of Aghor, is another revered shrine, which attracts pilgrims from overseas. Mud volcanoes resemble magmatic volcanoes in so far as they erupt powerfully, with flaming hydrocarbon gases reaching great heights; they also occasionally throw out tons of mud. 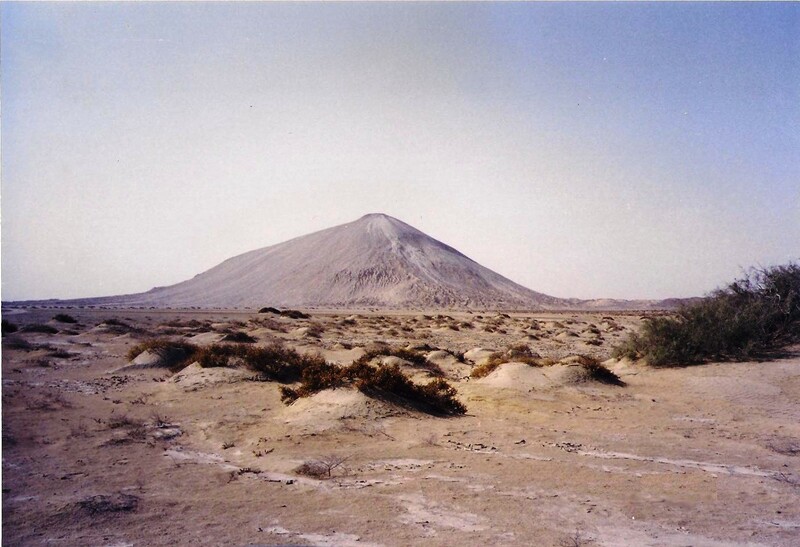 During the Makran tsunami and earthquake of 31 October 1945, the volcanoes were seen to be throwing up flames which shot up several hundred feet in the air. At night it was said to be a most eerie spectacle. There is said to be a direct relationship between petroleum deposits and mud volcanoes. They resemble super-deep exploration wells, providing valuable information of oil and gas. The near-exclusive occurrence of mud volcanoes in oil-rich countries like Azerbaijan, Iran, Malaysia, Mexico and Venezuela seems to confirm the petroleum linkage. Oil and Gas Development Corporation would do well to send some prospecting teams to do a survey, if not already done. Research done by a visiting team of scholars (1997-98) has found that the larger of the Chandra Kop trio has a conduit going down about 30 metres, into which fluid feeds a funnel-shaped mud lake. Being a sort of an underground reactor in which oil, gas and various minerals are synthesised, the volcano is also a source of some unusual substances. The oozing liquid is said to possess curative properties for the treatment of a range of diseases, although mud baths in health spas would be most incongruous in Baluchistan, in present times. A more promising prospect lies in including the Chandra Kops on the tourist map, while somehow ensuring that crass commercialisation does not spoil these geological wonders of Nature. © M KAISER TUFAIL. This is an open-access article published under the terms and conditions of the Creative Commons Attribution Licence, which permits unrestricted use, distribution, and reproduction in any medium, provided the original author and source are credited. This article appeared in the daily newspaper, The News International, 27 May, 2001. During a trip to Pasni in 1984, I had attempted to locate an ancient Harappan settlement of Sokhta Koh. Based on scanty information gleaned through Sir Mortimer Wheeler’s “Indus Civilisation,” I had attempted an exploratory foray “some 8 miles north of Pasni,” as the book stated. Breakdown of an ill-suited Suzuki pick-up and a near shoot-out with heavily armed Baluchi tribesmen was what came out of that sojourn. A decade later, I got another opportunity to visit Pasni in connection with an Air Force assignment. After a few abortive attempts at locating the site, I was glad to bump into Jemadar Musa, belonging to the semi-nomadic settlement of Sindi Passo in the vicinity of Sokhta Koh. He was sure about the settlement of the “matkah wallahs” as he put it and, after a couple of minutes drive from his village, he led me to the site. My first impression was that the hill had been aptly named Sokhta Koh (meaning “burnt hill”) and, that Musa’s naïve description of the ancient settlers could not have been better. I visited the site almost daily for about a week and have been able to put together an amateur account of the observations along with aerial and on-site pictures. 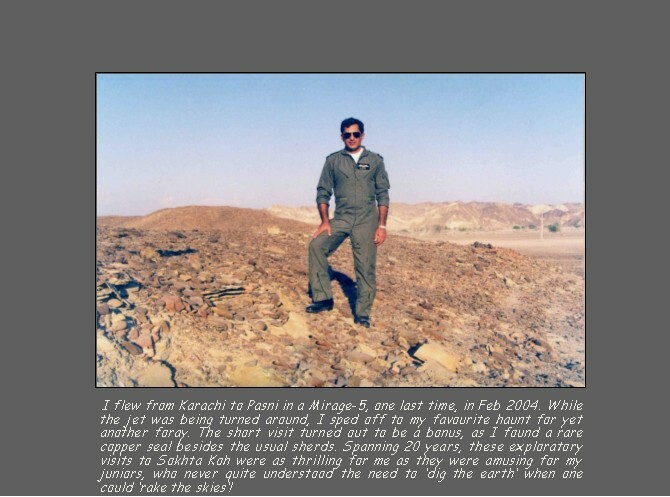 The site was first discovered by an American archaeologist George F Dales in 1960, while exploring estuaries along the Makran coast. A similar site at Soktagen-dor lies about 30 miles inland, astride Dasht River, north of Jiwani. Their position along a coastline that was possibly much farther inland goes well with evidence of overseas commerce in Harappan times. These coastal sites were also the source of some exotic shells used for bangle jewellery by the Harappan elite. Sokhta Koh is an outcrop of rock in the Shadi Kaur (river) valley, surrounded by jagged, stratified hills north of Pasni. Presently, the river flows just next to the site while loops of old riverbeds meander nearby. Small rivulets and nullahs mostly fed by rainwater, empty into Shadi Kaur, itself rather anaemic in this stark and dry countryside. The nearby present day settlement of Sindi Passo is sustained by small-time agriculture, with barley crop livening up the cheerless landscape, as it must have done several millennia ago. While the hill is about three kilometres in circuit, the habitable remnants of the visible settlement towards the east occupy about 17 hectares. The settlement itself is difficult to appreciate from the ground since no structures stand out in relief. Except for a few sporadic digs, the site has not been extensively excavated. I got an opportunity to photograph the site from the air with a hand-held camera. This became possible since the site is near the holding point for recovering aircraft. Dry ravines, which mark out the northern and southern boundaries, traverse the site. Also visible are several circular features that, as later survey revealed, were signs of open-pit ovens buried under rubble. 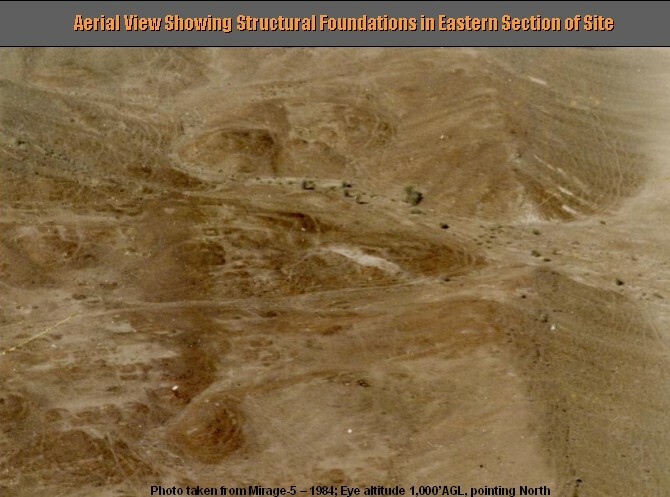 Another noteworthy point is the lack of visible evidence of walled fortification from the air, although traces of a portion of a wall are visible; this may have been a compound wall defining functional or social spaces in a portion of the settlement. The site is strewn all over by thousands of potsherds which constitute the visible detritus of the extinct settlement. The sherds are of kiln-baked ware that includes jars, plates, pierced colanders, lids with knobs and fine terra cotta bangle-shaped pieces. 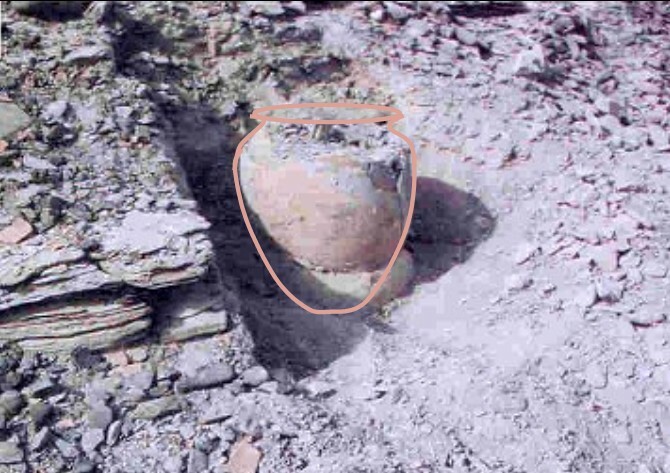 The pottery is wheel-turned and mostly pink, with a few buff samples. Some wares, particularly jars, have a reddish glazed band around the neck. The designs are a decorative feature of most pottery and are only of black colour. Designs are restricted to geometrical shapes and include horizontal lines of varying thickness, fish scale patterns, intersecting circles, comb-like patterns and wavy lines. Human and animal motifs are notably absent. Pottery styles suggest that the site was contemporaneous with major cities of Mature Harappan Phase (2600BC-1900BC). Out of the samples collected, two very interesting ones stand out. One is the broken rim of a jar with etched marks in the shape of the letter ‘V’ and several oblique and vertical strokes, possibly a potter's insignia. On another sherd, small fingerprints over wet paintwork are evident, perhaps those of a child who may have been playing around. The complete absence of toys, seals, statues and jewellery, at least at the uppermost level, indicate a rather utilitarian environment, though it is also possible that these may have been scavenged over the millennia. Further excavation is bound to reveal at least some elements that might mitigate the seeming socio-cultural isolation of this Harappan outpost. Sokhta Koh may have been abandoned due to recession of the coast caused by forces of nature in several ways. Firstly, deposition of alluvial soil into the harbour, by Shadi River would have caused gradual silting over centuries. Secondly, sea wave action would have deposited sand into the harbour accentuating the previous effect. Finally, geological plate tectonics, which is an active phenomenon along the Makran Coast, is likely to have caused catastrophic uplift, heaving the estuary floor and leaving the dockyard with a lowered water level. 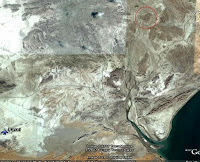 It is speculated (by this writer) that Sokhta Koh was then abandoned and the locals moved south to a new location of Prahag, near the present day town of Pasni, at the mouth of Shadi Kaur. The site at Prahag is littered with potsherds, like its predecessor. A coastal site is unique in many ways and, from the standpoint of an archaeologist, it offers many prospects. 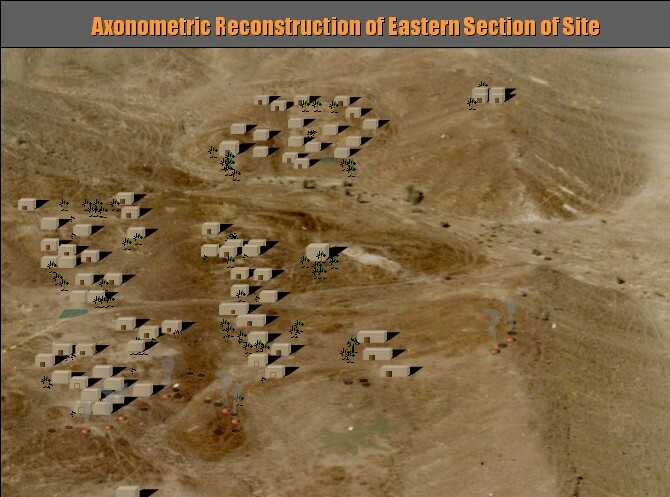 Location of a dockyard or other maritime wherewithal, discovery of hitherto unknown designs of sea-going vessels marked on pottery or in the shape of toys, and studies of the extent of maritime trade and cultural exchange with the Sumerians of Mesopotamia, are some possibilities at Sokhta Koh. It would also be worthwhile gauging the extent of political integration of far-flung peripheries like Sokhta Koh, by comparing designs of artefacts and degree of their standardisation compared to the Harappan heartland. Sumerian, Elamite and Iranian influences on local customs and myths could be better understood, given their relative proximity to the Makran Coast. 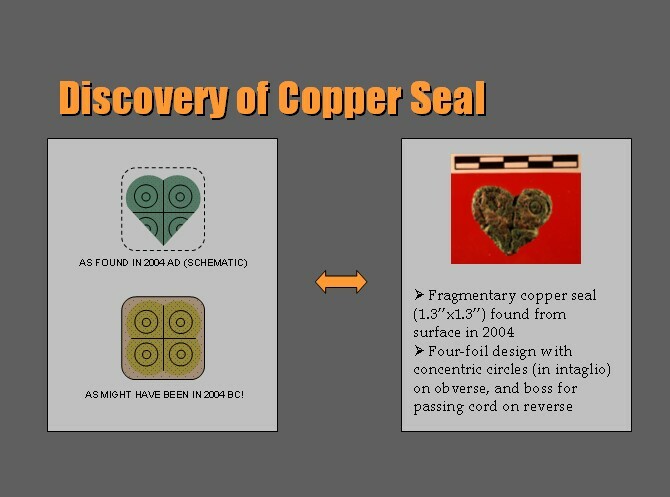 It is also not too far-fetched to imagine evidence of bilingual commercial transactions in the shape of clay tablets etc, that may be found in a coastal settlement like Sokhta Koh – a “Rosetta Stone” perhaps, that could help break the code of the enigmatic Indus script. This is an updated version of an article that appeared in the daily newspaper, The News International, 17 May, 1996.